Last weekend I had a very epiphanic trip in Calgary. It all started when I finally watched Food Inc., and was absolutely blown away. The film brought about anger and disgust, but it also sparked determination to make a difference. I was enlightened by what I saw. This is not to say I was completely ignorant of what went on in certain sectors of the food industry, but I was in a state of denial. Prior to being forced to watch the movie (well almost forced, someone clicked play even though I detested against watching it), I knew what took place at factory farms, and I knew processed foods and snacks were coated with preservatives and chemicals, I just never gathered up courage to face the truth. Food Inc has changed my life. From this day forward I vow to focus on organic foods and support local farms more than ever. I will frequent the Farmer’s Market more than stopping at Costco, and will even grow my own fruits and vegetables come spring. Now, let’s be honest here, I’m not going to completely cut junk food out of my life. I will still eat that Big Mac once in awhile and enjoy a Blizzard on a blistering summer’s day. I believe in balance and consumption in moderation and that applies to the good and yes to an extent, even the bad – this is being realistic. I will however, read the labels more carefully, lean towards organic, sustainable, eco-friendly products, and consider the repercussions when I purchase items from large corporations who weigh profitability over the working conditions of their staff. (I apologize for the rant… when I turned a lunch conversation into a passionate spiel of opinions and beliefs I got a “oh oh, here we go again!”). Ironically that same night we had reservations at Farm. What a perfect way to kick start my focus on eating local. I must start by praising the house brewed iced tea. It is phenomenal, possibly the best and most unique brew I’ve tasted. It had a lightly sweetened, citrusy note, with an enticing floral scent. I had to ask the waitress what the secret was: orange oolong, (can’t remember what kind of) black tea, vanilla, apple juice. We start off with The Cutting Board – a mix and match selection from a list of cheeses and cold meats. The cheese was wonderful, and the way it was plated was ingenious yet so simple. The charcaturie and/or cheese is lined up in columns with its proper pairing condiment. Logical and straightforward, there was no need for trial and error to find the optimum combination. Although the selection we chose was not local, except for the Copa which is from Alberta, it was fabulous. There was a section called “sharing” but it was a unanimous decision from the group that everything would be shared that evening. 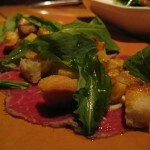 First up was the beef carpaccio. 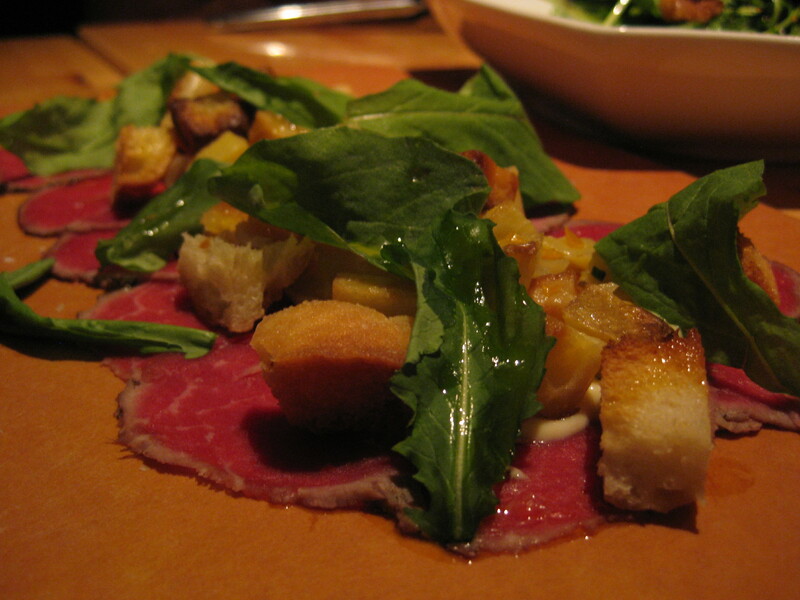 Supplied by Pura Vida, this flavorful plate of paper thin sliced beef was decorated with cubed potatoes and garlic aioli. Delicious. 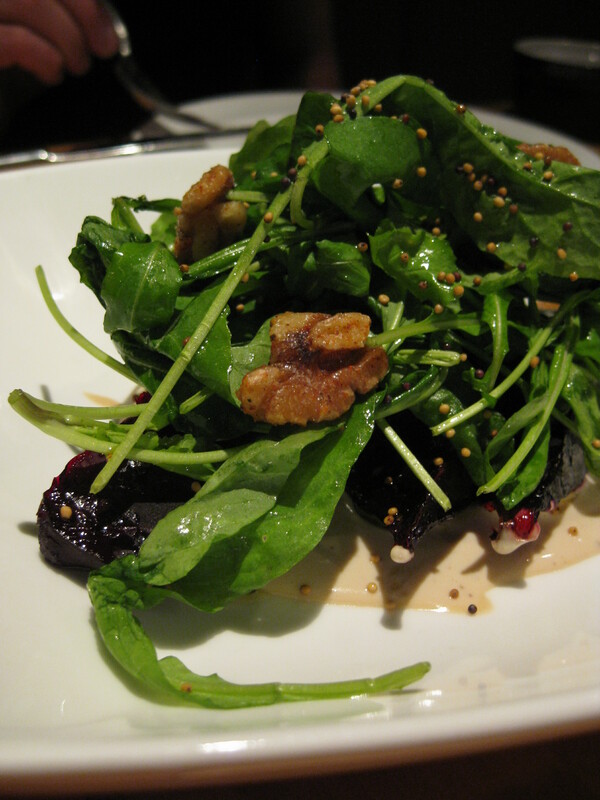 Then came a warm roasted beet salad, also picked from a local farm, served with arugula and candied walnuts. Also delicious. 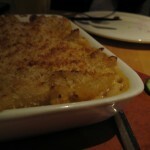 Third was Janice’s Mac and Cheese. This beautifully golden baked pasta was a bit spicier than expected (not that I’m complaining, but one guest mentioned the inconsistency). Spiciness aside, it was absolutely scrumptious. 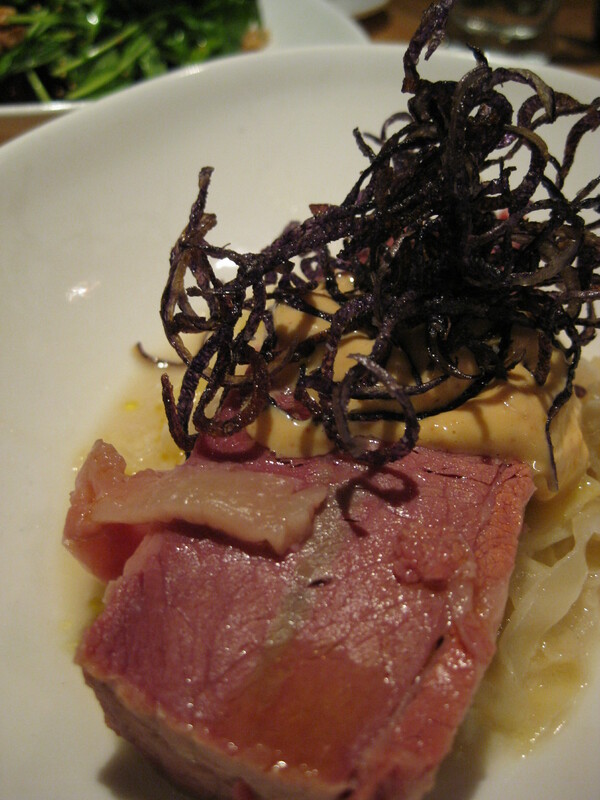 Last came the corned beef, which sadly was less fabulous compared to the other dishes. The taste was there, but the texture was not as flakey as I preferred it to be. Dessert was different. 2 menus were presented, one the chocolate selection, the other the standard dessert menu. 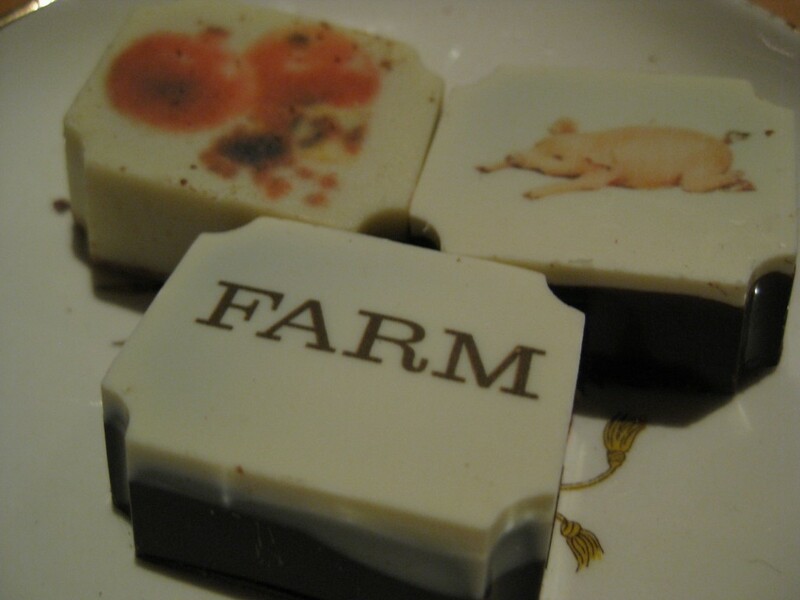 While the chocolate choices were decent, we went with pomogranante with white chocolate, and caramel with dark chocolate, the one chocolate with the least consensus was bacon. Bacon and chocolate, I’ve heard of it many times, but never tasted it until now. I’ve been told you either love it or hate it, but I think I’ll just say that I don’t care for it. We finished everything off with a goat cheese panna cotta, which was nothing astounding and definitely needed more honey. Was it slightly overpriced? Yes and no. When compared quantity wise – yes, by the end I was satisfied by not overly full. For the amount spent I would have hoped to me more stuffed. In terms of supporting local produce grown in sustainable environments – no, I accepted the cost of spending more on food that was chemical free and good for the body. With a cozy atmosphere and warm service, either way I had an enjoyable evening. What better way to support our local farms and businesses. Poutine for dinner? Why the heck not! No, I’m not talking about New York Fries or some other sad version of food court poutine (alright, I will retract the statement about NYF, which I actually enjoy after a productive shopping trip). 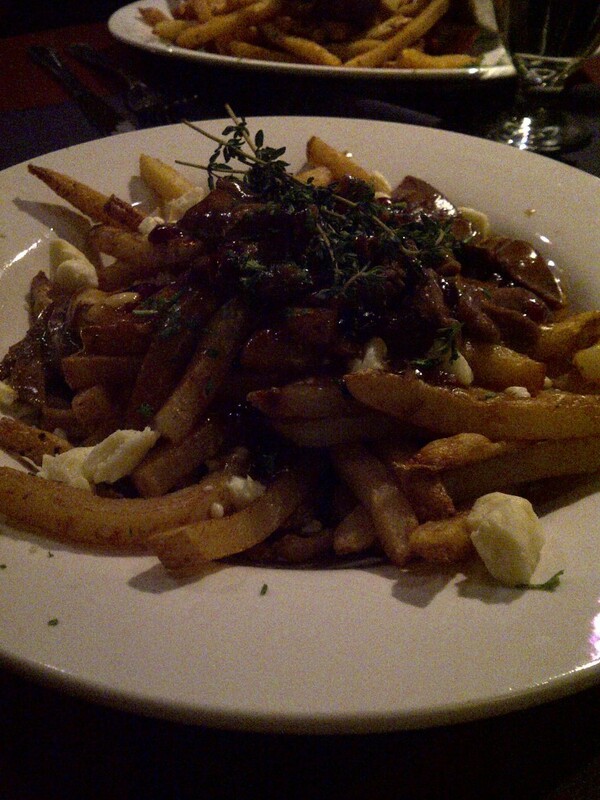 I’m talking about Duck Confit Poutine from Laurier Lounge – real Quebecois cuisine. In a restaurant that is as beautiful as the food it serves, scattering shredded bits of confit duck on a mound of crispy fries, mozzarella curds, dried cranberries, mouth watering gravy, and fresh sprigs of thyme seems fitting. You haven’t tasted real poutine until you’ve tried this version. At first glance you may feel regret for not ordering the poutine as an appetizer, but as you devour into the crispy, tender, salty, sweet melting pot of textures and flavors, the richness of the gravy and duck begins to kick in. A bottle of Don de Dieu beer, also brewed in Quebec, boasting a 9% alcohol content will wash everything down perfectly, and you will still have room for dessert. The restaurant is dark and intimnate, perfect for a romantic night out, with a hint of brassserie style. A second floor opens up more seating space within this historical building. The single family dwelling built in 1908 was home to George Stanley, historian, author, soldier, teacher, and designer of the current Canadian flag. This historic ambiance can be felt instantanously by the creak of the floors, maturity of the walls, and slight hint of musk in the air. Seating is limited, so be sure to reserve before you head out. 70 kinds of maki rolls. 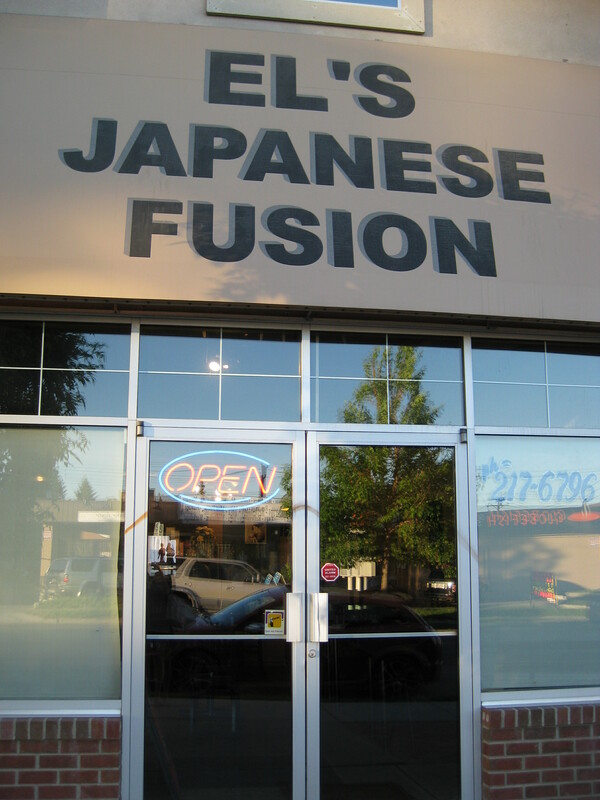 El’s Japanese Fusion in Calgary offers an astonishing 70 different rolls to select from. The last time I was here, I was so gosh darn excited there were no pictures taken, heck I barely knew what I was eating (mostly because I didn’t order). A perfect excuse to revisit! 1) Blue Dragon Maki: fresh water eel and avocado – my favorite of the bunch. 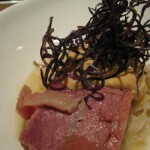 It was prepared very well, the eel was smooth and sauce was sweet. Simple yet tasty. 2) Super Star Maki: deep fried Spider roll (soft-shelled crab) with scallop on top – also incredibly delicious, although I oddly thought the ratio of crab to rice was too much… nobody else seemed to mind. 3) Rainbow Maki: crab meat, salmon, tuna, scallop, prawn, mackerel, avocado – beautiful and fresh tasting. 4) W-Spicy Maki: spicy tuna and spicy salmon – sounded like an excellent idea in theory but once eaten was slightly disappointing. The tuna and salmon were undistinguishable. To my surprise, I had already tried 3 of the 5 rolls with a completely different group of diners during my previous visit, and it was as delicious the first time as it was that day. Another reason to love this small family owned shop is honesty. One of our guests had previously tried El’s tasting menu. 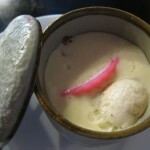 Within that menu he ate a delicious Japanese seafood egg custard called chawanmushi. In an attempt to share this experience, we asked if it could be made on such short notice. To our surprise, the chef agreed. 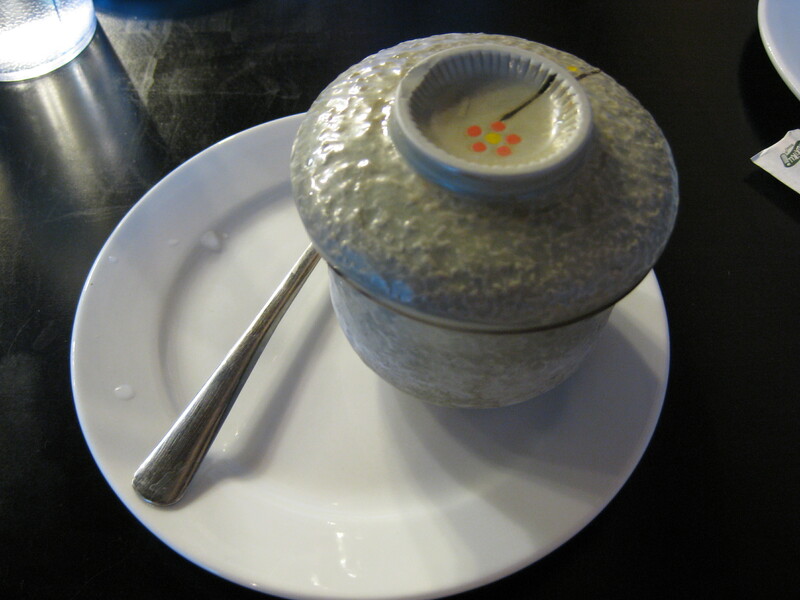 When the individual cups of smooth steamed custard arrived, it tasted comforting and delicious, but our guest thought something was missing. We were told, voluntarily, that because of the time constraint saki was not included in today’s order, and that if we called ahead next time, our chawanmushi would be prepared to perfection. Now that is a chef who cares about what he serves his customers. A weekend in Calgary with good friends and good food can only end with good results. 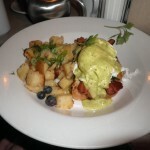 Avenue Diner was our choice for brunch. Located in the heart of downtown Calgary it was only a stone’s throw away from the hotel. 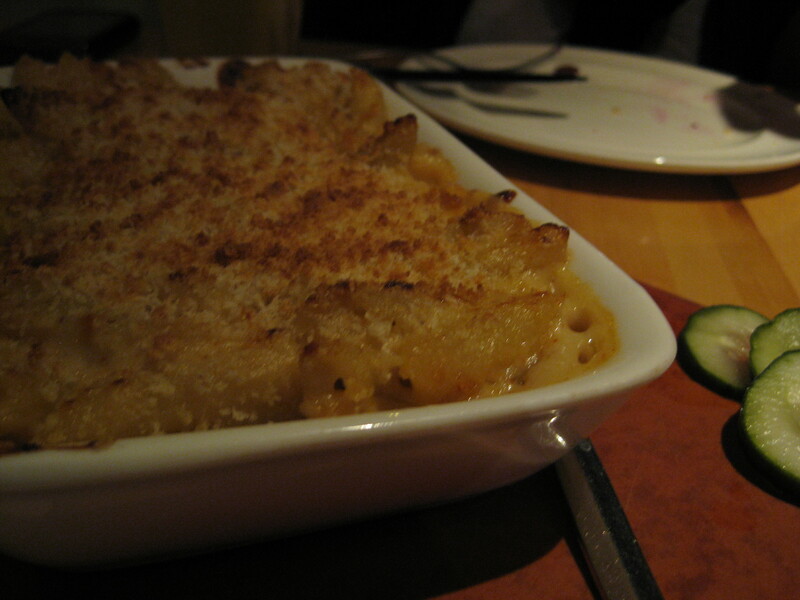 As we ran into this small and narrow diner, escaping from the dreadful May rain, we were greeted by a mouth-watering picture of baked macaroni and cheese. Not even seated in the dining room yet, I already knew what to consider ordering. Visual media you’ve done it again! 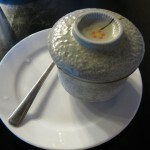 The menu is simple and straightforward, yet there is nothing simple about the dishes offered here. What was complicated, was deciding on what to order. Everything looked delicious! Luckily, no strenuous decisions were to be made. Several of us wanted to try the same dishes and were more than happy to share, another reason to dine with many close friends. 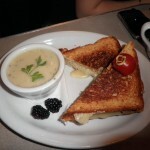 We ordered: Avenue Florentine Eggs Benny with Organic Spinach, Smoked Bacon and Garlic Roasted Shallots; Three-Cheese Grilled Cheese with Danish Fontina, Aged White Cheddar and Double Cream Brie; Dad’s Famous Aged White Cheddar Mac and Cheese with Truffle Oil and Mushrooms. 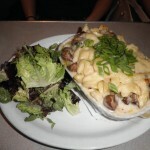 Avenue Diner has the right to boast being “the superhero of comfort food”. 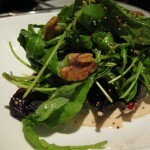 Each dish was spectacular, everything was fresh, and it was all very comforting. The egg on the Benedict was poached to perfection and the sauce was light yet rich in flavor, the grilled cheese had the most complimenting medley of creamy cheeses, and the mac and cheese (although not advertised exactly as the photo out front) was familiar yet modern with the truffle oil adding an upscale twist.